I’m in the process of updating the information in my guidebooks, Inland Trips from the Costa Blanca, and Small Hotels and Inns of Eastern Spain, which means that I’m spending a fair bit of time on the road. A few weeks ago I was reviewing a route that goes through eastern Valencia, and calls at the Santuario Cueva Santa, which is a chapel in a cave 20 metres underground. It’s a couple of years since I’ve been there, so I thought I’d update the photos. 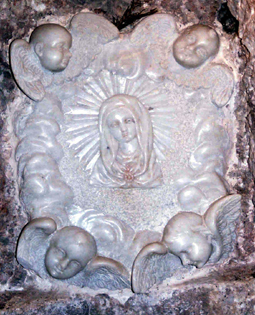 The sanctuary is dedicated to the Virgin of the Holy Cave, known as the White Dove, and, unsurprisingly, she is the patron saint of Spanish speleologists (cavers). The whole thing is built around, both spiritually and structurally, a small bas-relief stucco image about 20 centimetres high that’s housed in a lovely Doric-style temple built in the cave, where the image now sits, surrounded by jade and gold. The stairs down into the cave are lined with tile votive plaques giving thanks for prayers answered and ailments miraculously cured. Being a cave, it’s pretty damp, but it’s said that if a drop of water lands on you from the ceiling and you rub it over the part of your body that’s ailing, you will be cured. Drops taken from the puddles on the floor will also work but without the same efficacy. You’ll also be cured if you hear the tinkling of a bell when visiting the cave by night, which will be a bit difficult as it’s only open during daylight hours. My arrival was one of those remarkable moments of miss-timing. I’d driven there specifically to take photos, and not another living sole or a car on the car park were to be seen. But just as I began to go down the stairs the cleaner arrived to do the weekly full dust and polish. I sat on a cold and damp metal bench waiting for her to have a quick flick around with the duster, but no…she’s going to do a proper job. All the bouquets in their vases are taken out, alter cloths are removed and candles taken down from the holders. I sat patiently in my shorts and T-shirt, listening to the drips hitting the puddles at my feet as the chill raised goose bumps on my arms. After fifteen minutes of watching Mrs. Mop do a thorough top-to-bottom of the whole fancy chapel, giving a little nod of adulation to the Virgin each time she passed, I decided that I’ll not bother. Nothing had changed since my last revision a couple of years ago, and I sincerely doubt anything will change in the next two years till I’m due back around again. I put my damp camera back into its bag and re-entered the land of the living and a beautifully sunny day. This entry was posted on October 2, 2010 at 12:38 pm and is filed under Uncategorized. You can follow any responses to this entry through the RSS 2.0 feed. You can leave a response, or trackback from your own site.